ReviStimTM micro-current technology is different Unlike most TENS units available today, the DC micro-currents used by ReviStim are scientifically proven to stimulate revitalization of damaged cells and tissues in the area of pain rather than simply block the perception of pain. You experience pain when the injured cells let you know they cannot survive in an unhealthy environment. In order to be healthy, your cells and nerves need oxygen and nutrition, which are increased by improving micro-circulation. Clinical research has proven the electrical micro-currents produced by ReviStim increase blood circulation and oxygen perfusion to accelerate healing. The currents are barely perceptible and similar to those naturally produced by the body, which makes ReviStim an ideal choice for nighttime treatment of pain and wound healing. ReviStimTM - Pain Relief Kit provides pain relief with two electrode types. The tab electrodes relieve pain by stimulating nerve ending and acupuncture sites on the foot with micro-current electrical stimulation, while the butterfly electrode can be used on the back, shoulder, knee to provide deep microcurrent therapy that improves circulation and relieves pain. Features: FDA cleared for 24/7 use small, lightweight wearable device two treatment programs 30-minute treatment eight-hour treatment that cycles on for 20 minutes and off for 40 minutes The eight-hour treatment program is perfect for nighttime use, which optimizes the natural healing cycles of the body while you sleep. 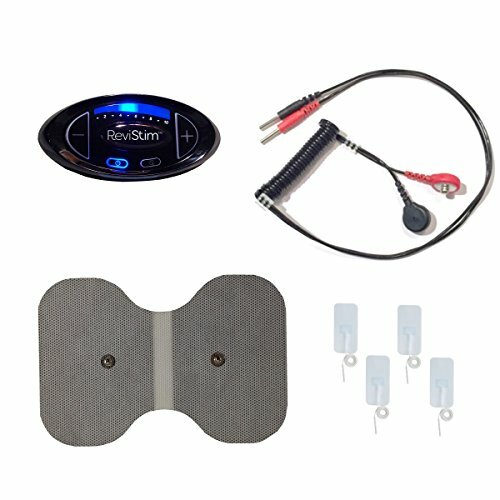 ReviStim prescription technology is now available as an over the counter therapy Previously only available with a prescription, ReviStim technology puts the healing power of revitalizing micro-current stimulation in the palm of your hand for a fraction of the cost of prescription devices with the same functionality. If you have any questions about this product by ReviStimTM, contact us by completing and submitting the form below. If you are looking for a specif part number, please include it with your message.